Earrings, ornaments decorating the ears, have been one of the principal forms of jewelry throughout recorded history. The term usually refers to ornaments worn attached to the earlobes, though in the late twentieth century it expanded somewhat to include ornaments worn on other parts of the ear, such as ear cuffs, and is used to describe pieces of jewelry in earring form, even when they are worn through piercings in other parts of the body (for example, in the nose). The most common means of attaching earrings to the earlobes has been to pierce holes in the lobes, through which a loop or post may be passed. But a variety of other devices have also been used, including spring clips, tensioning devices such as screw backs, and, for particularly heavy earrings, loops passing over the top of the ear or attaching to the hair or headdress. In many cultures and contexts, earrings have traditionally been worn as symbols of cultural or tribal identity, as markers of age, marital status, or rank, or because they are believed to have protective or medicinal powers. Even when they have served other purposes, however, the primary function of earrings has been a decorative one. As earrings are so prominently placed near the face, and at the juncture between costume and coiffure, they, perhaps more than any other element of jewelry, have been particularly responsive to changes in fashion; as hairstyles, hats, collars, and necklines have risen and fallen, earrings have correspondingly increased and decreased in size and prominence, and during many periods they have been instrumental in balancing and tying together the desired fashionable appearance. 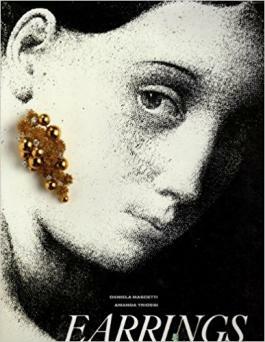 In antiquity, earrings were one of the most popular forms of jewelry. The crescent-shaped gold hoops worn by Sumerian women around 2500 B.C.E. are the earliest earrings for which there is archaeological evidence. By 1000 B.C.E., tapered hoop (also known as boat-shaped) earrings, most commonly of gold but also of silver and bronze, had spread throughout the Aegean world and Western Asia. In Crete and Cyprus, earrings were embellished with twisted gold wire, clusters of beads, and pendants stamped out of thin sheet gold. In Egypt, earrings were introduced about 1500 B.C.E. and were later worn by both men and women. Many Egyptian earrings took the form of thick, mushroom-shaped studs or plugs, which required an enlarged hole to be stretched in the earlobe; these could be of gold, with a decorated front surface, or of humbler materials such as colored glass or carved jasper. Ear studs consisting of two capped tubes that screwed together could be worn alone, but some also had elaborate pendants of gold cornflowers, or falcons with flexible tail feathers inlaid with glass. In the first millennium B.C.E., Etruscan and Greek goldsmiths brought new refinement and artistry to earrings, which were valued as both an adornment and a sign of wealth. Variations on the hoop were the so-called leech earring, a thick tube secured by a hidden wire, and the Etruscan box-type earring, which encased the earlobe in a wide horizontal cylinder. Disk earrings, with pendants in the form of amphorae (ancient Greek jars), figures of Eros, and decorative beads and chains, were another popular form, joined about 330 B.C.E. by twisted gold hoops with animal-head finials. All of these forms were stamped out of thin sheets of gold and decorated with fine palmettes, scrolls, and flowers in twisted wire and granulation; such earrings were fairly light in weight, but gave an extremely rich effect. Roman earrings were similar to Etruscan styles until the first century C.E., when new styles with disks and pendants mounted on s-shaped ear hooks appeared. Colored stones and pearls were favored, and earring styles proliferated to satisfy the Roman taste for ostentatious display. At its height, the Roman Empire had the effect of standardizing styles of jewelry over much of the known world; after the center of influence shifted to Byzantium (Constantinople) in C.E. 330, and Roman influence began to decline, local variations once more emerged. Characteristic Byzantine earrings were plain gold hoops with multiple pearl pendants hung on chains, and crescent-shaped earrings of gold filigree. In Europe, earrings virtually disappeared between the eleventh and sixteenth centuries, as hairstyles and headdresses that completely covered the ears, and later high ruff collars, made them impractical. Earrings finally began to revive in the late sixteenth century, as ruffs gave way to standing collars. At first, complex enameled designs were popular, but improved techniques of gem cutting soon shifted the emphasis to faceted diamonds. In the seventeenth century, large, pear-shaped pearl pendants were a favorite earring style, and those who could afford to do so wore two in each ear. It was also fashionable to wear pendant earrings on strings or ribbons threaded through the earlobes and tied in bows, and to tie ribbon bows at the tops of earrings to achieve the same effect. Similar earring styles were also worn by fashionable gentlemen, but usually in one ear only. By the late seventeenth century, earrings had become an essential element of dress, and larger and more elaborate forms began to develop. Two of these became the dominant styles of the eighteenth century: the girandole, in which a single top cluster branches out like a chandelier to support three pear-shaped drops, and the pendeloque, a top cluster with a long single pendant. New sources of diamonds, along with new methods of cutting them, developed early in the eighteenth century, made them the material of choice for jewelry, and high-quality paste imitations were also available. Glittering girandoles and pendeloques, visually tied to the ears by stylized ribbon bows of diamonds set in silver, effectively balanced the high, powdered hairstyles of the period. Despite their refined and delicate appearance, such large earrings were quite heavy; some had additional rings soldered to the tops, permitting the wearer to take some of the weight off of her ears by tying the earrings to her hair. When the neoclassical style of dress and simpler hairstyles came into fashion at the end of the eighteenth century, earrings became lighter and simpler. Jewelry of cut steel, seed pearls, Berlin iron, and strongly colored materials such as coral and jet, harmonized well with neoclassical fashions, and classically inspired cameos and intaglios were set in all kinds of jewelry. Heavy girandoles gave way to pendant earrings composed of flat, geometric elements connected by light chains. "Top-and-drop" earrings, composed of a small top element attached to the ear wire, from which a larger, often teardrop-shaped element is suspended, also came to the fore around 1800, and remained the most popular earring style throughout the nineteenth century. Matched sets of jewelry, known as parures, assumed new importance in the nineteenth century, and they were available even to women of modest means. These sets usually included at least a matching necklace or brooch and earrings, but could also include bracelets, buckles, and a tiara or tiara-comb. In the 1810s and 1820s, the trend toward lighter and more delicate jewelry continued, and settings of gold filigree or elaborate wirework (known as cannetille) were very popular. In the 1820s, a romantic interest in the past also inspired jewelry designers to revive historical styles from the ancient world to the eighteenth century, and a modified version of the girandole earring returned, along with elaborate gothic tracery and rococo-revival scroll-work. As hairstyles became more elaborate in the 1830s, earrings became more prominent, with small tops and long drops reaching nearly to the shoulders. In spite of their size, these earrings were fairly light in weight, owing to lightweight settings of gold cannetille or of repoussé (embossed relief raised from behind with a hammer), which had largely replaced cannetille by the 1840s. Earrings with long, torpedo-shaped drops of carved gemstones with applied gold filigree were also popular, many with detachable drops to allow the tops to be worn alone. In the late 1840s and through the 1850s, a new hair-style, with hair parted in the middle and gathered to the back of the head in loops that covered the ears, caused a virtual disappearance of earrings. Around 1860, once again owing to a return to upswept hairstyles, long pendant earrings made a comeback, and through the 1860s and 1870s they were produced in an astonishing variety of styles. One major theme was historical revival, with Egyptian and Classical styles particularly popular. Some revival earrings, such as those produced by the Castellani family in Rome, were fairly faithful reproductions of recent archaeological discoveries; others were fanciful pastiches of classical earring forms, architectural elements, and other motifs such as amphorae. Earrings with carved classical reliefs of coral or lava, or Roman glass micro-mosaics, were very fashionable, and were often brought back as souvenirs by travelers to Italy. Other popular styles were naturalistic renditions of leaves, flowers, insects, and birds' nests in gold, enamel, and semiprecious stones; enameled renaissance-revival styles; and, for more precious gems, floral sprays and cascades. A new style in the 1870s was the fringe or tassel earring, with a graduated fringe of pointed drops suspended from a large oval pendant. In the last two decades of the nineteenth century, large pendant earrings went out of fashion, in part because they were incompatible with the newly fashionable high dress and blouse collars, and with the elaborate "dog collar" necklaces worn for evening, which almost completely covered the neck. Small single-stone and cluster earrings, either firmly mounted to the ear wire or mounted as pendants to move and catch the light, were the most commonly worn style through the early twentieth century. The most fashionable earrings of all were diamond solitaires, which became more available after the opening of the South African diamond fields in the late 1860s. New cutting machines and open-claw settings, both of which increased the amount of light reflected by diamonds and made solitaire earrings more appealing, were developed in the 1870s. To prevent valuable diamond earrings from being lost, catches were added to secure the bottoms of the ear wires. Another innovation, first patented in 1878, was the earring cover, a small hinged sphere of gold, sometimes finished in black enamel, which could be snapped over a diamond earring to protect it from loss or theft. By the end of the century diamond ear studs (also called screws), with a threaded post passing through the ear, and held securely in back by a nut screwed onto the post, were also popular. By 1900, as earrings declined in size and importance, many women stopped wearing them altogether. Some commentators denounced ear-piercing as barbaric, and women who pierced their ears were considered "fast," or not quite respectable. (In the United States, some of the reaction against pierced ears may be credited to the desire of "native" Americans to distinguish themselves from the large numbers of immigrant women, almost all with pierced ears, who were arriving from Europe at the time.) In spite of piercing's negative image, small screw earrings continued to be worn, and new screw-back fittings, which could be tightened onto unpierced earlobes, were available for those who did not wish to pierce their ears. Around 1908, pendant earrings were revived, but with light, articulated drops of smaller stones rather than single-stone drops; diamonds, pearls, and stones matching the color of the costume were the most popular materials. The earring revival continued into the 1910s, aided considerably by a growing acceptance of costume jewelry. Jewelry could now be selected for its decorative value rather than its intrinsic value, and women could afford to own many pairs of earrings to match particular costumes; the rise of costume jewelry also made ear piercing less necessary, as women were less concerned about losing inexpensive earrings. (Many women, as was still true in the early 2000s, also had adverse reactions to the cheaper metals used in costume jewelry, which made pierced earrings seem less practical.) The fashion for the Oriental and exotic inspired by Paul Poiret and the Ballets Russes was reflected in bead necklaces and long drop earrings of Chinese amber, jade, black and red jet (glass), and carved tortoiseshell. Empire-revival fashions also inspired a revival of nineteenth-century jewelry styles and materials, including cut steel and cameos. By the early 1920s, earrings were again almost universally worn, and the range of exotic styles had expanded to include hoop and pendant earrings of Spanish or Gypsy inspiration, Egyptian styles inspired by the discovery of King Tutankhamen's tomb in 1922, nineteenth-century antiques, and picturesque "peasant" styles from around the world. As reported by the New York Times in 1922, in the 1920s earrings could "no longer … be considered as an article of jewelry; they are the article of jewelry." With dress styles now comparatively simple, and many women bobbing their hair, earrings were considered an essential finishing touch-a means both of filling in the area between the ear and shoulder and of expressing the wearer's personality. Bold geometric pendant earrings, made of diamonds and platinum contrasted with strongly colored materials such as onyx and lapis lazuli, were displayed at the Exposition International des Arts Décoratifs in 1925, and this style, which became known as Art Deco, remained popular for both precious and costume earrings for the remainder of the decade. In the early 1930s, although there was no sudden change in style, earrings began to move closer to the head again, partly in response to smaller, close-fitting hats and the return of high, tied and ruffled collars. Another major influence was the introduction, in 1931, of clip fastenings for earrings, which made it possible to concentrate ornamentation over the earlobe, and compact designs following the line of the ear soon became popular. Matching earrings, bracelets, and other jewelry made of brightly colored bakelite were another signature 1930s look. For evening, long earrings in Art Deco style were still popular, but earrings with white stones (diamonds or pastes) were now the most popular, and the pendants now added volume by branching out to the sides, in a modern version of the girandole, or "chandelier," style. In the 1940s, compact clips or screw backs, often made with a matching brooch, were the dominant earring style. Gold, strongly colored stones, and bolder, more sculptural forms were now preferred, in keeping with the padded shoulders and highly structured coiffures of the period. Close-to-the-ear styles, with clip or screw backs, continued to be the most popular in the 1950s, but settings became more delicate, to harmonize with the more deliberately feminine fashions in the years following Christian Dior's 1947 "New Look" collection. An important look of the 1950s was the matched set of choker necklace and button earrings, and these were produced in a wide variety of styles and materials, including newly developed plastics. White and colored rhinestones were popular, as were beads and faux pearls of all kinds, colors, and finishes, often looped in multiple strands around the neck, and fastened with a clasp of clustered beads matching the earrings. Ear piercing, while still not common, began to revive in the early 1950s; in the United States, the trend began as a fad among college girls, and Queen Elizabeth II set an example for many in England when she had her ears pierced in order to be able to wear diamond earrings she received as a wedding present in 1947. In the 1960s, as in the 1920s, clean-lined dresses and hairstyles, including the long, straight hair popular later in the decade, provided an ideal background for large and decorative earrings. Earrings were again among the most important of accessories, and were often designed to stand alone, rather than as part of a matched set. In both fine and costume jewelry, abstraction was popular, and creative design, visual impact, and wit were often considered more important than the intrinsic value of jewelry. Hoop earrings were one of the signature styles of the decade, and they appeared in designs inspired by tribal jewelry, enormous space-age styles of chrome and plastic, and kinetic designs of concentric, articulated rings. Ethnic styles, particularly from India and the Near East, were also popular, and delicate dangling earrings helped to propel handcrafted sterling silver jewelry, which had been growing in popularity since the 1940s, into the fashion mainstream. By the early 1970s, the new fashionable ideal was the "natural look," and large costume earrings disappeared in favor of smaller and more delicate earrings, usually of silver or gold, and almost always worn in pierced ears. In terms of design, earrings remained fairly inconspicuous throughout the decade, though they were given new prominence by the fashion for multiple piercings in the same ear, which began as a teenage fashion around the middle of the decade, and continued into the twenty-first century to be a popular way to wear earrings. Earrings worn in the upper part of the ear, and ear cuffs, which grip the edge of the upper ear, were fashions introduced late in the decade. The 1970s was also when earrings for men returned to fashion after a 300-year absence; earrings had continued to be worn by sailors, by some homosexual men, and by members of groups such as motorcycle gangs, but many more men now began to wear single earrings largely for their decorative value. Large and flashy earrings, both real and frankly fake, returned in the 1980s, to balance the bolder shapes and colors, padded shoulders, high-volume hairstyles, and dramatic makeup then in fashion. Chunky button earrings covering the lower half of the ear and large pendant hoops were popular styles, and common finishes were shiny gold, bright colors contrasted with black, and a variety of bronzed and iridescent metallic finishes. Even relatively understated earrings tended toward strong shapes, worn close to the earlobe; though most women still had pierced ears, clips were popular because they kept earrings close to the head, and because they distributed the weight of heavier styles. In the early 1990s, silver, brushed finishes, and simple, elegant earrings began to succeed the shiny gold and jagged shapes of the 1980s, in keeping with the monochromatic and minimalist mood of fashion. At the same time, the trend toward simple, versatile clothes that could be dressed up or down inspired women to use elaborate or unusual earrings to vary the effect of an ensemble, and earring styles proliferated. Since the mid-1990s, there has not been a dominant style in earrings, although historical revivals have been an important trend; the popularity of glamorous "chandelier" earrings inspired the return of girandole and top-and- drop designs from the eighteenth and nineteenth centuries, along with the more familiar kinetic designs of the 1920s and 1960s. 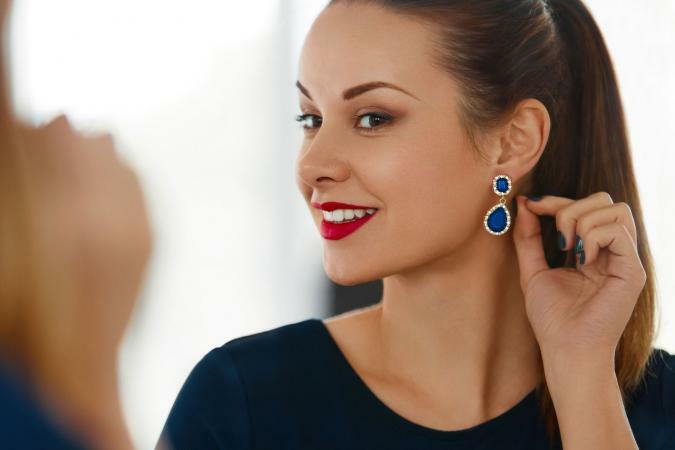 Earrings have become a popular form of personal expression, and how and when they are worn, along with their function within an ensemble, became largely a matter of personal choice. See also Bracelets; Brooches and Pins; Costume Jewelry; Jewelry; Necklaces and Pendants. Andrews, Carol. Ancient Egyptian Jewellery. London: British Museum Publications, 1990. Bury, Shirley. Jewellery 1789-1910-The International Era. 2 vols. Woodbridge, Suffolk, U.K.: Antique Collectors' Club, 1991. Fales, Martha Gandy. Jewelry in America 1600-1900. Wood-bridge, Suffolk, U.K.: Antique Collectors' Club, 1995. "Fashions: Earrings Essential Now for Smart Dressing." New York Times (23 July 1922): 80. Flowers, Margaret. Victorian Jewellery. New York: Duell, Sloan and Pearce, 1951. Mascetti, Daniela, and Amanda Triossi. Earrings from Antiquity to the Present. London: Thames and Hudson, Inc., 1990. Scarisbrick, Diana. Jewellery. London: B. T. Batsford, Ltd., 1984. --. Tudor and Jacobean Jewellery. London: Tate Publishing, 1995. Walters Art Gallery, Baltimore. Jewelry, Ancient to Modern. New York: Viking Press, 1979.